Hospitals and healthcare systems must move away from revenue streams dominated by inpatient services and focus on establishing patient-centered, quality-based initiatives that reduce hospital-acquired infections and length of stay. Driven in part by mandates within the Patient Protection and Affordable Care Act, the Centers for Medicare & Medicaid Services (CMS) has taken steps toward incentivizing providers to reduce hospitalization costs. From penalizing facilities with high readmission rates for certain conditions to denying additional payments for certain hospital-acquired conditions (HACs) to establishing primary care-centric care models that reward quality and savings, the actions undertaken by the CMS will impact elder care in particular. Survival under these reimbursement models will require hospitals and health systems to move away from revenue streams dominated by inpatient services and instead focus on establishing patient-centric, quality-based initiatives that serve the dual purpose of reducing HACs that extend lengths of stay and eliminating avoidable readmissions. For most, the key lies in collaborative care—a longitudinal approach long advocated by the geriatric care community. A primary driver of the CMS’ push to reduce hospitalization and readmission rates is the impact it will have on costs. According to a November 2011 report from the Healthcare Cost and Utilization Project, inpatient stays for elderly patients accounted for $154 billion in healthcare expenditures in 2009. A 2011 study from the Dartmouth Atlas Project found that one in six Medicare patients was readmitted to the hospital within 30 days of discharge. The annual cost for those readmissions, according to commentary in the April 2012 issue of The Journal of the American Medical Association, is approximately $26 billion. While reducing the costs associated with elder care is important, it isn’t what drives support from geriatricians. They are far more interested in the impact the push will have on overall health and quality of life in a population for whom hospitalization can have life-changing consequences. Amy E. Boutwell, MD, MPP, president of Collaborative Healthcare Strategies in Lexington, Massachusetts, concurs that the CMS efforts will ultimately change care delivery for the better. However, she is concerned that its focused incentives could unintentionally create disincentives for providers to place the same emphasis on the full range of high-risk or frail patients. Specifically, the CMS Hospital Readmission Reduction Program will penalize hospitals with high readmission rates for acute myocardial infarction, heart failure, and pneumonia. Medicare has also stopped providing additional payment for preventable HACs, including retained surgical objects, air embolism, blood incompatibility, stage 3 and 4 pressure ulcers, falls and trauma, poor glycemic control, catheter-associated urinary tract infections, vascular catheter-associated infections, surgical site infections, and deep vein thrombosis. “Medicare has decided to send a very strong signal to the field that certain diagnoses and conditions warrant special attention,” says Boutwell, who works with healthcare organizations to deploy collaborative care programs that reduce readmissions and improve care transitions. “If the vast preponderance of attention is paid to improving care to elderly heart failure patients, I worry about frail adults who have a wide variety of conditions or who don’t have a critical diagnosis but instead have limited cognitive functions. “The reason why CMS picked the first three conditions is because they are associated with high rates of readmission. But they are not exclusively reflective of the challenges and conditions that the vast majority of older adults have in this country,” she adds. Nonetheless, Boutwell says the CMS is pushing hospitals in the right direction by giving them the incentives necessary to effect change. “One principle of quality improvement is that you have to start somewhere,” she says. Given that they are on the front lines of the CMS’ efforts, hospitals are a natural starting point. Medicare fee for service in its current form financially rewards hospitals for high admission rates and longer lengths of stay. There is no incentive beyond a commitment to quality to establish collaborative relationships across the care community that would intervene before a patient’s health devolved to the point where a hospital stay was necessary. The emerging quality-focused care and reimbursement models are turning that incentive structure upside down. While the penalties are unlikely to exceed the revenues lost to reduced census, they are a big enough stick to justify investing in programs to keep patients out of the hospital. For example, the Care Transitions Intervention from the University of Colorado is a four-week program during which patients with complex care needs work with a transition coach to learn self-management skills to ensure their needs are met as they transition from hospital to home. Participants are significantly less likely to be readmitted to the hospital, and the benefits were sustained for five months after the one-month intervention. The Transitional Care Model created by Mary Naylor, PhD, RN, director of the NewCourtland Center for Transitions and Health at the University of Pennsylvania School of Nursing, involves screening, patient and caregiver engagement, symptom management, collaboration, continuity and coordination of care, and maintaining patient relationships. It is implemented by an advanced practice nurse using evidence-based protocols focused on long-term outcomes and has been shown to result in fewer hospital readmissions, fewer total days rehospitalized, lower readmission charges, and lower charges for healthcare services after discharge. Another example is Ouslander’s INTERACT (Interventions to Reduce Acute Care Transfers) quality improvement program. Supported by a grant from The Commonwealth Fund, INTERACT reduces the frequency of transfers from skilled nursing facilities to hospitals by providing communication tools, care paths, or clinical tools and advanced care planning tools for use in identifying, evaluating, and communicating resident status changes. 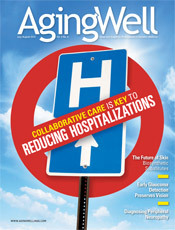 In contrast to an exclusively hospital-centric program, Boutwell created the Institute for Healthcare Improvement’s STAAR Initiative (State Action on Avoidable Rehospitalizations) as a unique cross-setting and regional approach. Launched in 2009, the STAAR Initiative currently works with Massachusetts, Michigan, Ohio, and Washington on a multistakeholder approach to improve transitional care across settings over time by engaging providers and policymakers on a regional basis. The goal of the STAAR Initiative is to reduce avoidable rehospitalizations by providing strategic guidance, support, and technical assistance to cross-continuum teams to improve transitions in care. Participating hospitals focus on effecting cross-setting process improvements and relationships through four key processes: enhanced assessment of posthospital needs, effective teaching and facilitating enhanced learning, real-time handover communications, and timely posthospital care follow-up. “The most basic model that I have witnessed in the past three years … is literally having providers in one facility talking to providers in other facilities. It sounds so basic and many people think it happens on a regular basis, but it doesn’t,” Boutwell says. “In the STAAR Initiative, the very first requirement is that hospitals form care continuum teams. Boutwell notes that many care models now in the spotlight have actually been in existence for years. However, financial and risk barriers left many hospitals reluctant to participate. The CMS is helping to lower those barriers by aligning financial incentives with quality outcomes. This makes it easier for hospitals to realize the benefits of deploying collaborative care models that follow older patients after they are discharged to reduce the number of readmissions. Although the financial stick being wielded by the CMS currently hangs only over the heads of hospitals, the consensus is that true change cannot happen without the ambulatory side of the house taking an active role. Indeed, the efficacy of an ambulatory-centered proactive care management program has already been demonstrated through a large-scale three-year study led by David A. Dorr, MD, MS, an associate professor with the departments of medical informatics and clinical epidemiology and general internal medicine and geriatrics at Oregon Health & Science University in Portland. The study, published in the December 2008 issue of the Journal of the American Geriatrics Society, was conducted at 13 primary care clinics at Intermountain Healthcare. It found that deaths among the patients in the intervention group that received optimum care through the Care Management Plus (CMP) program were significantly lower in the first and second years than among those in the control group whose members received the usual care. CMP, which is led by Dorr, integrates health IT and personalized coordinated care. Physicians refer patients with complex conditions to a nurse care manager who completes a patient assessment and creates a detailed care plan. These efforts are supported by structured protocols and guidelines for various conditions and diseases, a care management tracking database, and a detailed electronic patient worksheet. The care manager suggests medication changes or other treatments when indicated, helping physicians respond to patients’ needs more quickly and efficiently. “We have shown that we can reduce hospitalizations by 24% to 40% in two years,” Dorr says. He notes that any program that successfully reduces admissions while simultaneously keeping the elderly patient’s health goals in mind is a step in the right direction. The challenge is eliminating the fragmentation that plagues the system so that the patient can be kept at the center while the various providers come together to drive the right care decisions. Primary care-driven programs, such as patient-centered medical homes, accountable care organizations, and the comprehensive primary care initiative, have great potential for improving elder care—provided they are accompanied by the proper training and technologies necessary to ensure the teams involved in a patient’s care are able to take a holistic approach. Dorr’s enthusiasm for the efforts underway by the CMS is tempered by his concern that reimbursement models that have the potential to penalize providers for a justified admission could actually create greater fragmentation within the healthcare system. Another concern is the potential that many of these coordinated care models could be mistaken for capitation, which would wind up incentivizing withholding of care rather than right-sizing utilization. The benefits of collaborative care are far too significant to let it slip by the wayside if healthcare reform is repealed or the CMS determines its efforts are not having the desired impact. That is why the next generation of providers is being given the tools they need to take a team-based, patient-centric approach to patient care. At the Betty Irene Moore School of Nursing at the University of California, Davis, the primary focus is collaboration and communication across care settings to deliver better, more cost-effective care. By teaching students how to organize and lead interdisciplinary care teams, the hope is that collaborative care will become the norm. Young notes that healthcare is typically viewed as being provided in a hospital or clinician’s office. In reality, health needs happen everywhere. That disconnect between where the need is and where care is delivered has led to a backward approach that fails to equip individuals to manage their own health. Collaborative care, she says, lets providers get closer to where healthcare really happens: in the home and the community. This requires a team approach and the ability to understand how tools such as social media and the Internet can play a role in helping older adults self-manage their health and stay out of the hospital. It also requires understanding the role of technologies such as remote monitoring and sensors in properly managing chronic conditions. The trick is teaching clinicians how to apply these technologies in ways that advance the individual’s care goals. — Elizabeth S. Roop is a Tampa, Florida-based freelance writer specializing in healthcare and health IT. Perhaps no other model of care is as dependent upon data as the collaborative care model. Without the ability to access, analyze, and exchange patient information and utilize predictive modeling and risk management tools, accountable care organizations, patient-centered medical homes, and other patient-centric team-based care approaches cannot succeed. “One major tool that is essential is population data. People need to know whom they’re taking care of, whom they are sharing the patient with so they know whom to partner with. As we work concretely to improve care transitions, we run into challenge after challenge with the lack of information providers have available to them regarding their patients. It’s more difficult than it should be to dissect what happened and what the opportunities for improvement should be,” says Amy E. Boutwell, MD, MPP, president of Collaborative Healthcare Strategies in Lexington, Massachusetts. According to information from Care Management Plus (CMP), the patients of a single primary care physician will cumulatively see more than 100 separate specialists in the course of one year. Patients with five or more chronic illnesses will see 13 providers. When that is added to the increased need for community and social support, it is easy to understand why technology and information exchange is at the heart of CMP. To facilitate such goals, Dorr developed the Integrated Care Coordination Information System (ICCIS), a care coordination system that integrates EHR data into a supplemental Web tool to enable better care planning, information management, and reminders to clinicians about best practices. In use at more than 20 clinics across the United States, the ICCIS is part of the TOPMED project and will be utilized by clinics to perform self-evaluations under the state of Oregon’s patient-centered primary care home program. It delivers a wide range of important functionality, including patient summary worksheets, care management encounter documentation for various activities, electronic assessment tools, encounter ticklers for task management of care activities and condition-specific reminders, provider-specific patient lists, high-risk patient list, and ad hoc searching for subpopulations, interactive quality reporting, and an overall clinic summary report of care coordination activities. ICCIS is a start, but Dorr is quick to point out that much work remains to get technology and technical support into the hands that need them most: patients and individual clinicians.